In the beginning, there are people who sit down with a Bible alone. In the end, most walk away with nothing. There is a reason I got nervous, why I would be nervous if someone told me this, and why you should also be nervous. That reason is first and foremost that the Bible is not a book. It is an anthology. It contains a variety of literary works from histories to testimonies to epistles and should not be read in order. I don’t know the entire history of how the Bible was compiled, but it largely has to do with the historical writing of the texts. The first five books of the Bible relate to Moses and his teachings. The rest take the reader through the history of the Jewish people becoming a kingdom in Israel, being dominated by Babylon, and finally returning to their country. The New Testament then starts with the gospels, the events which immediately followed (through Acts), then a collection of letters to churches “getting things wrong,” and then the book of revelations (which for reasons we won’t even get into– you should also not let someone start there). If a person truly wants to learn about Christianity, they should first go to Christ, to the gospels. That all being said, I just finished my first full reading of the Old Testament myself. I meditated on this over and over as I read it. The only thing I can think of is this: the Old Testament is so difficult to get through because it was so difficult for the people of God to live through. There are hardships most of us will never know in the Old Testament. There is slavery, wandering through a literal desert, war, and being conquered by an outside power, just to name a few. These times were hard to get through. They had to strip away what made them outsiders to God and try to become His people. Much like with some of our own family histories, it can seem like there aren’t interesting stories. Then you hear about the weird, miraculous events where someone’s car spun on ice on the highway and didn’t hit any cars. Then you hear darker stories about another person which you wish weren’t part of your family’s story. The Old Testament is a lot like that. And, just like if someone has you sit down to listen to the stories you might get bored and feel like you didn’t learn anything, or that those stories don’t apply to “now,” we can feel that way with the Old Testament. Absolutely. The Bible is a text which brings new meaning every time you read it, depending on where you are in life (as it should). You might be in a place where you are feeling lost and forsaken, in need of a higher power to intercede (many of these stories are in the Old Testament). Maybe you’ll feel like I did through most of it: This is really dry. Many of these laws don’t even apply anymore since Jesus fulfilled our cleanliness/sacrificial laws. But, just like we ought to learn our own family stories, to build on where we came from toward where we are going, we ought to learn the Church Family Story. 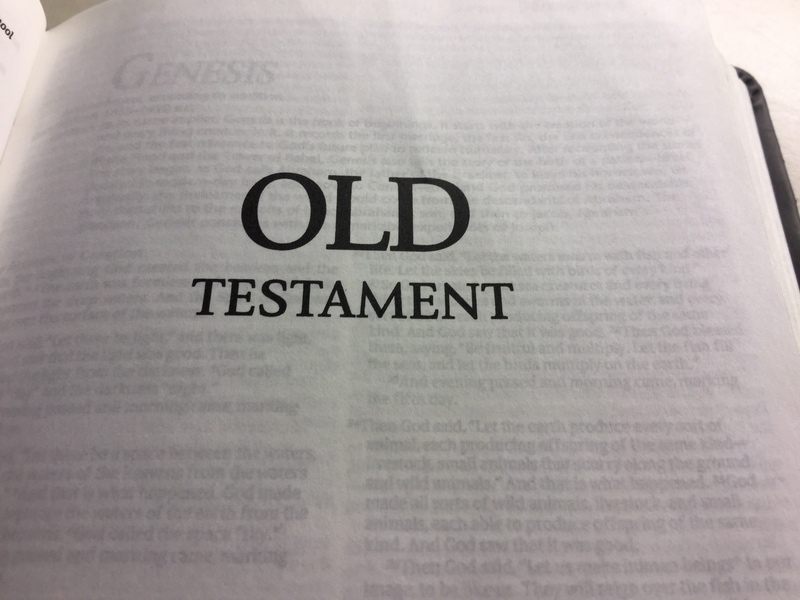 Without the background of the OT, we would not have the New Testament. God chose a people to give us a savior through; though we don’t classify ourselves as Jewish, it is where our church started. I hope that if you are reading the Old Testament right now, and struggling through it, that you don’t feel alone or even bad about that. I have failed reading it through multiple times. If you’re looking for a place to get started with the Bible: I still recommend the New Testament. There is no reason to learn about the history of a family you are not a part of, unless it is mere curiosity. There really, also, isn’t reason to read most of the New Testament before reading the gospels. There is no reason to learn about the church’s beginnings unless you seek to be a part of one, to learn about living as a Christian, unless, again, you are merely curious. And curiosity is fragile. Faith in Christ always starts with Christ. Perhaps, if you are reading the Old Testament, or even the New Testament, and finding yourself in a dry patch, flip to a gospel and take a break for something a little more life giving. Life has been particularly difficult lately, which is why I’ve not written for a little bit. I hope that if you’re having a difficult time, that you are finding comfort in God, in the Bible, through prayer, in His church. You are not alone.